Simple, the benefits outweigh the cost. This machine provides a cost-efficient operation. In fact, you can also add simple accessories such as vise and clamp to enhance drilling accuracy and usability. Moreover, you can smoothen the surface of your workpiece at ease with this tool. 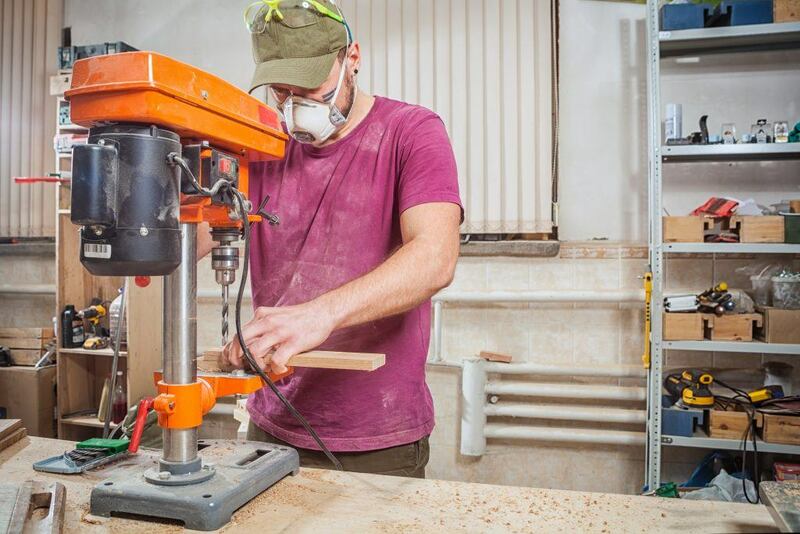 If you don’t have a solid idea on how to choose the right drill press, it’s a good thing you came to our place. 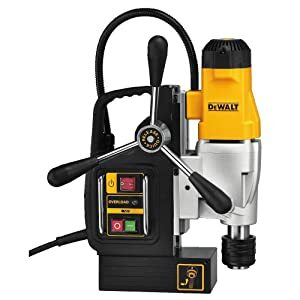 Here, we have a buying guide and balanced in-depth product reviews showing you the pros and cons of the top 10 best drill press for 2019. 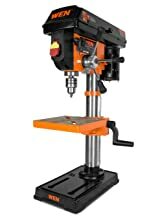 How to Choose the Best Drill Press? If you want to choose the right tool, you need to know the features and factors to be considered. Let me show you those things below. Look for the machine with a solid and durable build. This gives you a first impression of a long lasting machine. Adjustable speed setting is important to give you more work options. When dealing with metals, you’ll work on a slower speed while a faster rpm for wood materials. In general, there are two types – the floor model and a bench top model. Choosing which type needs consideration on how large are you usually working on. Floor model best fit for large scale workpiece while bench top type is a practical choice when working on smaller projects. This is a critical component for it provides support for your workpiece. Top rated units have wide tables for more space to adjust and work on. It’s also great if the table can be rotated 360 degrees so that you can work on different angles. Likewise, it can smoothly run up and down for working height adjustment. This is a gadget of the machine which ensures constant drilling depth if you have several holes to make. This actually depends on the material you’re working on. If its metal, then you’ll need a higher HP requirement compared when working on wood surfaces. Heavier equipment is better as it sustains more balance while working on constant rotations and vibrations. Several accessories can be attached to your machine to enhance accuracy and versatility. Drill press vise and clamps can be used to hold the workpiece firmly in place. Other accessories include detachable bit storage and fences. We like it for it looks rugged but tough and heavy, no worries for balance and shaking. The baseplate may seem small but it’s solid and definitely can support the head of the tool. The castings are smooth and dent-free. The 5 level speed settings paired with the bevel adjustments just make it extra flexible for any work. Great tool for investment. There’s one slight suggestion which is to change the way how depth adjustment is done because the two nuts set up seems to challenge. It’s a solid machine which is easy to set up. There’s an LED light for enhanced workplace visibility. The base is solid and chuck works fine. It also has a laser guide for drilling accuracy. It’s even better for there’s a digital display for the rpm status. Overall construction is solid and tough. Great tool for the price. There’s no spindle lock but overall it works amazing. It has a solid baseplate and lots of accessories for more work flexibility and usability. Most parts are metal and some are made from hard plastic. The drill allows you to adjust angles at 15° increments up to 90°. I like how you can do height adjustments from 16" to 29", that gives extra workspace. The machine really works pretty neatly and plunge handle has smooth adjustments. There are some suggestions for this tool like the nut used to adjust the screw on the body could have been thicker. The best features I like with this tool are the laser guide, digital LCD speed display, and mechanical speed adjustments where there’s no need to muck the belt. It’s simple to set up and better remove the rack and pinion fitting for the table before lubricating all the parts of the tool. Chuck fits straight and no wobbling issues. Great tool for investment. Slight issue with the table, it seems edges are very sharp and better if there was a rubber covering at the edges. It has smooth castings, overall construction is really tough, and nice paint finish. The chuck is perfectly fine though it’s very slightly off from zero. Amazingly, the drill rod and column are almost parallel with each other. the “slop” between the quill and head casting pretty neat, it’s 0.006” at zero while 0.012” at full extension. There's slight concern regarding the motor, it easily gets hot after running 15 minutes but it doesn't trip off which is absolutely fine. It's nice if they can do something about it. There's a lot of things to like about this drill. First, it's a great tool for an affordable price and the quality is not far from other brands. The overall build is rugged and solid. Its 3.2Amp ¾ horsepower motor gives a decent power for any job. The laser guide works really fine. Most of all, depth stop is smooth to adjust, no need for extra tightening. There are minor issues about it like for the height adjustment of the rack and pinion. It seems a bit clunky. There are tons of features to like about this drill. First, it can effectively drill through ½” to 1-1/4” thick steel and aluminum plates at 570 rpm. You’ll need higher rpm when dealing with harder metals like titanium. It makes accurate vertical holes with ease. No worries with overheating for it comes with a coolant bottle. The powerful magnetic drill is a good investment to have. There’s a minor concern regarding the arbor shaft for some units as it had eccentricity problems but it’s still manageable. 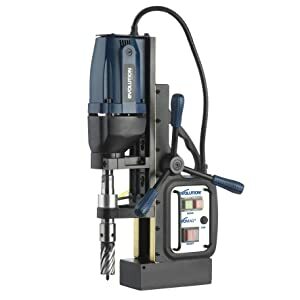 The drill’s performance amazing and its tool case is really nice and tough. It’s easy to set up and use. The 30mm annular cutter made a precise hole in the plate. Overall built of the machine is sleek and sturdy. It comes with a coolant bottle so you won’t have to worry about motor heating. Plus the quick change chuck system works neatly. Definitely a good value drill. There's a slight wobble in the chuck but can be fixed through tightening. Fantastic mini drill and it can effectively make holes in a 1/16" brass using a 1mm bit. It can also make precise holes in a 0.25mm silver sheet. The base is made from cast iron with a smooth and flat finish. It makes a perfectly great mini drill which worth an investment. The manual is slightly not that useful and friendly. There are several features to like with this tool. First, it has an accurate spindle, quill and chuck. There's a very little wobble in the chuck as it turns compared to other brands. Spindle rotation is amazingly smooth and very little deflection. For a mini drill, its motor has sufficient torque to get the job done. A slight issue about the quill, it gets slightly jerky during the turn. Its spring hangs up on the casting corners and doesn’t give the user constant feed.